Pear and Cranberry Crumble - Our Sunday Cafe, the Retirement Edition! This Pear and Cranberry Crumble is more delicious than the sum of its parts! It also happens to be a great spur of the moment dessert as well, with canned pears and dried cranberries readily available in your pantry. I had my dish of deliciousness plain, but it goes without saying that any form of cream, (whipped, iced or soured) would go ever so lovely on top! I enjoy collecting recipes that are not only delicious but can be made anytime from a well-stocked pantry. Our pantry is fairly basic, so don't let the term "well-stocked" throw you. We have just the basics due to space restrictions, but we still have stock enough to cook delicious desserts on the fly! The cookbook author states that leftovers make a great breakfast, but I would like to suggest that a wonderful brunch offering could be made with a doubling of the pear/cranberry ingredients and spread the crumble portion thinly over that. Combine the pear slices, sugar, cinnamon, nutmeg, vinegar and the dried cranberries. Gently fold together, and place in a buttered 9X6 baking pan. 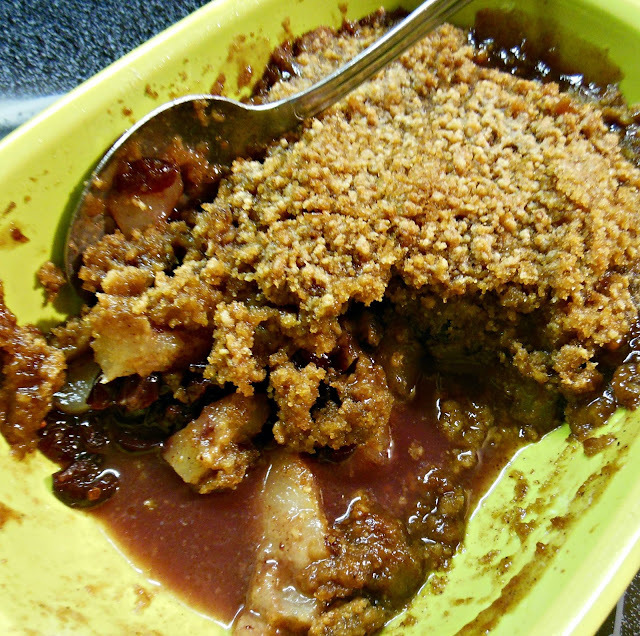 Pear and Cranberry Crumble, a delicious blend of fruit and crumble topping. By hand with a pastry maker (or the food processor works wonders here!) combine the flour, sugar, and butter, until crumbly, cover the top of the fruit evenly. Pear and Cranberry Crumble made with whole grain flour. Bake 40-45 minutes or until done in your oven. Serve plain or with a whipped cream garnish. I happen to have all of these ingredients on hand! I know what we are having tonight! Try it with a spot of sour cream, really delicious! Thanks for visiting. Who could eat one bite? I want to make this. Looks so simple and so yummy. The new Fabulous January Party link is up. Come over and bring the dessert! This one surprised me, it is that good! Thanks for visiting. Now I know what to do with that huge can of mixed fruits on my counter! Do we really need to bake it for 40-45 mins? Mainly to cook the crumble topping, and/or caramelized the fruits? HI Emily, it does have a wonderful caramelized flavor, I hope you give it a try. Thank you for visiting. A lovely dessert, Melynda! It has been ages since I last had any desserts with pears or even crumbles. Eating this with ice cream would definitely bring smiles to my kids! Hi Joy, it is a fun cookbook! The recipes are aimed at children, but delicious enough for adults to enjoy. So far it has been true. Thanks for stopping by. I love crumbles -- they are are perfect for breakfast! Hi Beth, I enjoyed this very much. Especially with a spoon full of sour cream! I love fruit crumbles but oddly enough, I have never done one with pears as they always seems so watery to me when cooked...maybe it is time I corrected this! I hope you give this one a try, thanks for visiting. This crumble looks so good, I have some pears I need to do something with, great idea! Thanks so much for sharing this recipe with us at Full Plate Thursday. Sounds good - thanks for sharing on the What's for Dinner linkup! Thanks for linking! I pinned your yummy recipe at The Fabulous Pinterest board with a link back here! The party is still going on come over and link all your Yummy recipes! Let's party over at The Fabulous Party! Love the sweet pear/savory cranberry flavour combination, Melynda! And I love that this delicious dessert can be made with canned pears too. I'd definitely be hoping for leftovers for breakfast! Hubs love pears and I needed another way. Love making crumbles. This looks great. Thanks, I really enjoyed this crumble.